After many years as a stay-at-home mother, Cathy Berube wanted to do something for herself. She never tried her rush her education, opting instead to care for her family. With their backing -- including a husband who worked long hours to support the home -- Cathy decided to head back to school. Staff at Grand Erie Learning Alternatives provided her with career advice and help to determine her educational requirements. Her first step was enrolling at Grand Erie Learning Alternatives to get her secondary school diploma. After deciding on the personal support worker program, Cathy, who was raised speaking French, faced a setback when she didn't pass the literacy test required for entrance. "I was able to speak English fluently, but struggled with reading and writing English sometimes." 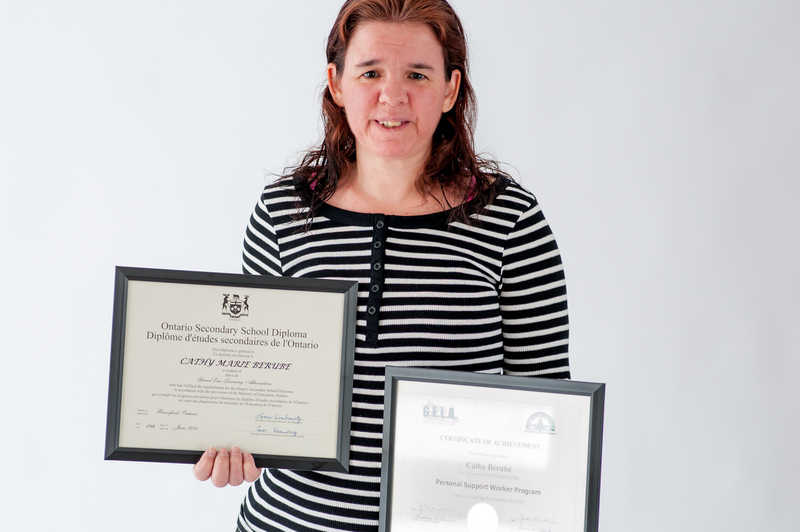 A literacy and basic skills program helped Cathy improve her English and she successfully re-applied for the PSW program. "I was so glad I didn't give up after my first application. The upgrading was worth it."